Section of the human esophagus. Moderately magnified. The section is transverse and from near the middle of the gullet. b. 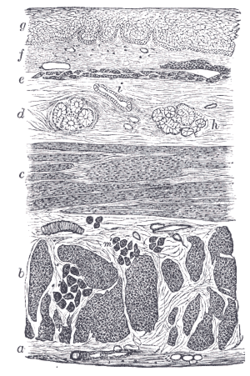 Divided fibers of longitudinal muscular coat. d. Submucous or areolar layer. f. Mucous membrane, with vessels and part of a lymphoid nodule. m’. Striated muscular fibers cut across. Section of submaxillary gland of kitten. Duct semidiagrammatic. X 200. Section of portion of mamma. ইউসি, ডেভিসের অর্গ্যানোলজিতে দেখুন: termscells&tissues/epithelial/exocrinegland/exocrinegland1 - "অন্তঃক্ষরা গ্রন্থি (এল.এম., লাও)"